Since the Friday and Saturday DCI Eastern Classic events in Allentown, Pa. are considered to be one show in two parts with the same adjudication panel, the results from both days will be considered as being from one event. Five corps broke 90 points in Allentown; only one more than had accomplished that feat at the DCI Southeastern Championship in Atlanta the previous weekend. 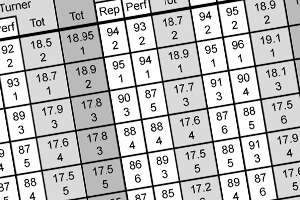 Two additional corps broke 80 for a total of 15, and all 22 corps broke 70 for the first time. While every corps increased their score from Atlanta, six corps bettered their finish and seven corps finished lower than on the previous Sunday. The scores of the two Effect captions are counted for full value, but with two judges in each Visual and Music Effect, the score from each Effect judge is averaged together with the score from the other judge in that caption. The scores of the three Visual and three Music captions are divided in half before being added to the final score, since each of those six judges utilize a scale up to a maximum of 20 points. View the Friday, Aug. 2 DCI Eastern Classic scoring recap. View the Saturday, Aug. 3 DCI Eastern Classic scoring recap. Blue Devils (1st-95.05) increased their score by 2.15 and took 1st place in Visual Effect, Visual Proficiency, Visual Analysis and Percussion. Color Guard and Music Analysis placed 2nd and Music Effect tied for 2nd with The Cadets. Brass took 3rd, though only 0.20 (0.10 after dividing in half) under 1st place Carolina Crown. Carolina Crown (2nd-94.85) added 2.35 to their Atlanta score and took 1st in Music Effect, Color Guard, Brass and Music Analysis. Visual Effect took 2nd by 0.05 and both Visual Proficiency and Visual Analysis took 2nd by 0.20 (0.10 after dividing in half). However, Percussion placed 6th, 0.90 down from BD's winning line and under Cadets, SCV, Bluecoats and Boston Crusaders. That represents a 0.45 gap in the total score, worth over twice the 0.20 total deficit to BD. The Cadets (3rd-93.70) added 1.70 since Atlanta, the smallest increase of the top four corps. Brass and Percussion took 2nd outright, Music Effect tied for 2nd with BD, Music Analysis finished 3rd and the remaining four captions 4th. In Atlanta, only Visual Effect and Color Guard were as low as 3rd. Santa Clara Vanguard (4th-93.45) put on 2.10 over the past week to take 3rd in every caption except the three 4th place captions of Music Effect, Brass and Music Analysis, closing the gap on Cadets to 0.25. Phantom Regiment (5th-90.00) added 1.00 to its Atlanta score and placed 5th in Visual Effect, Visual Proficiency and both Analysis captions, 6th in Music Effect, Color Guard and Brass and 9th in Percussion, down from 7th in Atlanta. Bluecoats (6th-89.05) experienced a gain over the past week of 0.85, the second least of any corps. Percussion tied for 4th with Boston Crusaders, Music Effect and Brass placed 5th and both Analysis captions tied for 6th. Visual Proficiency took 7th. Visual Effect tied for 8th, down from 6th and Color Guard finished 8th, up from 9th. The Cavaliers (7th-88.75) enjoyed a 3.40 rise in score and finished one position higher, moving ahead of Madison Scouts and closing the 2.85 gap with Bluecoats to just 0.30. Color Guard placed 5th, Visual Effect tied for 6th with Bluecoats, and Music Effect and Percussion took 7th. Both Visual Proficiency and Visual Analysis finished 8th. Brass was 9th and Music Analysis finished in 10th. Boston Crusaders (8th-88.50) picked up 3.50 and one placement with the second biggest score increase of any corps. Percussion tied for 4th with Bluecoats, up from 9th in Atlanta. Visual Effect and Visual Analysis each tied for 6th. Color Guard and Brass took 7th, Music Analysis was 8th, and both Music Effect and Visual Proficiency took 9th. Madison Scouts (9th-87.65) increased score-wise by 1.45, but dropped two placements due to the large gains experienced by the Cavaliers and Boston Crusaders. Visual Proficiency was 6th and Music Analysis tied for 6th. Music Effect and Brass was 8th and Visual Effect tied for 8th. Visual Analysis, Color Guard and Percussion all finished 10th. While Color Guard rose from 11th in Atlanta, Visual Analysis and Percussion both fell from 7th. Blue Knights (10th-86.00) added 1.45 to its total score, taking 8th in Color Guard and was 9th in Visual Analysis and Music Analysis. Music Effect, Visual Effect and Visual Proficiency finished 10th, Brass 11th and Percussion 12th. Blue Stars (11th-84.35) gained 2.20 and one placement since Atlanta, with a high point being 8th in Percussion. Both Effect captions placed 11th, Visual Proficiency and Visual Analysis finished 12th, Brass tied for 12th and Color Guard and Music Analysis took 13th. Spirit of Atlanta (12th-84.10) picked up 1.40, but dropped one placement. Brass and Visual Proficiency was 11th, Music Effect, Color Guard and Music Analysis finished 12th, Visual Effect and Visual Analysis 13th and Percussion placed 14th. Crossmen (13th-83.25) picked up 3.30 and one placement, taking 11th in Visual Analysis and Color Guard, 12th in Visual Effect and tying for 12th in Brass. Music Effect, Visual Proficiency and Percussion placed 13th and Music Analysis took 14th. Troopers (14th-81.65) added 1.70 and dropped one placement. Brass and Music Analysis finished 11th and the remaining six captions placed 14th, with Visual Effect and Color Guard tying in that placement. Pacific Crest (15th-80.25) improved 2.95 and one placement, tying for 14th in Percussion, taking 15th in Color Guard and Brass and tying for 15th in Music Effect with Colts. The other four captions finished in 16th. Colts (16th-79.65) picked up 1.90 and dropped one placement. Visual Effect tied for 14th, Visual Proficiency and Visual Analysis took 15th and Music Effect tied for 15th. Color Guard and Brass finished 16th, Music Analysis 17th and Percussion 20th. Oregon Crusaders (17th-77.15) picked up 2.75 and two placements, taking 16th in Percussion, tying for 18th in Music Analysis, placing 19th in Music Effect and finishing 17th in the other four captions. Mandarins (18th-76.05) improved 0.55 from Atlanta; the least increase of any corps. Consequently, they dropped one position. Music Effect and Percussion finished 17th, Visual Analysis and Color Guard 18th, Music Analysis tied for 18th, and the other three captions placed 19th. The Academy (19th-75.60) added 1.05 to their score and dropped one position. Music Analysis took 15th, Visual Proficiency, Brass and Percussion 18th, Visual Analysis and Color Guard 19th and both Effect captions finished in 20th. Jersey Surf (20th-75.15), in adding 4.50 to its score, enjoyed the largest score increase of any corps from the DCI Southeastern Championship. However, the corps again placed 20th. Both Effect captions took 18th, Percussion finished 19th, Visual Proficiency 21st and the other four captions placed 20th. Pioneer (21st-70.75) gained 1.90 and one placement, placing 21st in Visual Effect, Visual Analysis, Color Guard and Percussion and 22nd in the other four captions. Cascades (22nd-70.20) picked up 1.35 and dropped one placement, taking 20th in Visual Proficiency. Music Effect, Brass and Music Analysis finished 21st, and the remaining four captions 22nd.